Hanuman is a Hindu god, an ardent devotee of Rama. He is a central character in the Indian epic Ramayana and its various versions. He also finds mention in several other texts, including Mahabharata, the various Puranas and some Jain texts. A vanara (one who lives in forest i.e. 'vana'), Hanuman participated in Rama's war against the demon king Ravana. Several texts also present him as an incarnation of Lord Shiva. He is the son of Vayu, who according to several stories, played a role in his birth. Do you know about Hanuman, sir? He was the faithful servant of the god Rama, and we worship him in our temples because he is a shining example of how to serve your masters with absolute fidelity, love, and devotion. These are the kinds of gods they have foisted on us Mr. Jiabao. Understand, now, how hard it is for a man to win his freedom in India. Aravind Adiga in: The White Tiger by Aravind Adiga, ashutoshsrivastava.com. Lord Hanuman escorted me into the inner palace, where I gazed on Lord Rama in human form. Hanuman approached the Lord, on whose left side Lakshmana was present. I saw that Hanuman, while chanting the Lord’s praises, sometimes rotated the royal fly-whisk over him sometimes stood before him and recited spontaneous hymns, sometimes held a white umbrella over him, and sometimes massaged his feet. And sometimes he did all these things at once. From Brihadbhagavatam quoted in: Philip Lutgendorf Hanuman's Tale: The Messages of a Divine Monkey, Oxford University Press, 13 December 2006, p. 345-46. Hanuman, the well-known monkey god, can be seen in temples throughout the country. In some temples his image is set up alone standing with a mace in the right hand or sitting in a devotional posture before the images of Rama and Sita. He is considered to be the god of power and strength, who remained a celibate through his whole life. He is worshipped as being the greatest of Ram, who loves Hanuman the most. Suresh Chandra in: Encyclopaedia of Hindu Gods and Goddesses, Sarup & Sons, 1998, p. 116. Hanuman’s other names are Hanumat and pavana-Sut. He is the son of Vayu, the Lord of winds and Anjana, the female seduced by Vayu. Along with Ram, Hanuman is usually worshipped and he is the most favoured of wrestlers and grapplers. Tuesday is the sacred day on which lacs [hundred thousands] of Hindus worship and pray to him for strength and prosperity. Suresh Chandra in: "Encyclopaedia of Hindu Gods and Goddesses", p. 116. This god is described as having a short thick neck, a round red face, sharp white fangs, a mane like Ashoka flowers, a tail like Indra's banner and ability to expand until he could be as large as a mountain or to contract until he could become as small as a fly. Hanuman attends Rama, one of the incarnations of Vishnu, and personifies the ideal and faithful servant. He is the son of Pavana, the god of winds, and is noted for his speed and agility in which context he is often worshipped by young men and athletes. He leads a mythical forest army of monkeys, and is depicted as a monkey with a long tail. He takes a major role in the Ramayana epic searching for, rescuing the goddess Sita who has been captured by the demon Ravana. Suresh Chandra in: "Encyclopaedia of Hindu Gods and Goddesses", p. 115. It is said that the sure antidote of Saturn or Shanee's evil effect is the worship of Lord Hanuman. Scriptures say that when Saturn warned Lord Hanuman about his onset of the Seven and Half Years (w:Sade SatiSaade Saati) [period of bad times], the Monkey Lord accepted the challenge and allowed Saturn to have his play. When the planet dwelled on his head, the Monkey Lord ‘headed’ heavy rocks so viciously that the planet was almost crushed. Similar agony he faced when he tried to dwell on the Monkey Lord’ body and legs. Then the planet had to bow before the Lord, saying that whosoever worshipped Lord Hanuman shall be beyond the evil effect of the planet. A less-common form of Hanuman is the Panchmukhi—that which has five heads or faces. Each head represents an animal. The five animals are the monkey (Vanar), the horse (Hay-griv), the lion (Narasimh), the boar (Varah) and the eagle. Some of these are incarnations of Vishnu... - Parvez Dewan. A less-common form of Hanuman is the Panchmukhi—that which has five heads or faces. Each head represents an animal. The five animals are the monkey (Vanar), the horse (Hay-griv), the lion (Narasimh), the boar (Varah) and the eagle. Some of these are incarnations of Vishnu. There is also an eleven headed Hanuman (ekadash-mukhi) Hanuman. These two forms are the result of the popularity of the tantric cults during the medieval era. The five-headed Hanuman may have as many pairs of arms, or just one pair. The eleven-headed Hanuman normally has ten pairs of arms. ...He was able to fly and is a conspicuous figure in the Ramayana, ...Hanuman leaped from India to Ceylon in one bound; tore trees, carried away the Himalayas, seized the clouds and performed many other wonderful exploits... - John Dowson. HANUMAN, HANUMAT, HANÜMAT. A celebrated monkey chief. He was able to fly and is a conspicuous figure in the Ramayana, ...Hanuman leaped from India to Ceylon in one bound; tore trees, carried away the Himalayas, seized the clouds and performed many other wonderful exploits... Among his other accomplishments, Hanuman was a grammarian; and the Ramayana says: “The chief of monkeys is perfect; no one equals him in the sastras, in learning, and in ascertaining the sense of the scriptures (or in moving at will). It is well known that Hanuman was the ninth author of grammar. Hanuman represents the inner life that the confrontation with dukkha opens up. But his job is to help differentiate pure desire from the clinging that tends to obscure it. Hanuman's exploits fill the central part of the Ramayana. Mark Epstein in: Open to Desire: The Truth About What the Buddha Taught, Penguin, 5 January 2006, p. 26. For some it is primarily a story of devotion centering on the monkey-god Hanuman, who is something of a trickster but who is completely at the service of Rama, saving his life and rescuing his wife from the evil demons. Mark Epstein in: "Open to Desire: The Truth About What the Buddha Taught", p. 22. Hanuman, the embodiment of devotion, brings Sita's jewels to Rama and then takes a gold ring back to her as a symbol of Rama's unflagging love, a ring given to him by Sita's father at the time of their marriage. Sita welcomes Hanuman, takes the ring and gives him one more jewel, a pearl mounted on a gold leaf that her father had tied to her hair on the day of the wedding. She refuses Hanuman’s offer to fly back to Rama, insisting he come to free her himself...Rama is able to free Sita only by securing the help of Hanuman. Hanuman, the monkey-god, son of the wind, is the bridge between the two lovers, the vehicle that helps them. ...After leaping to Lanka Hanuman discovers the captive Sita surrounded by rakshasas in the Ashoka grove, but she insists on being rescued by her husband...Kirsti Evans. Grief-stricken Rama meets a tribe of vanaras whose chief Sugriva and eloquent minister Hanuman become Rama's devoted helpers in the task of rescuing the princess [Sita]. After leaping to Lanka Hanuman discovers the captive Sita surrounded by rakshasas in the Ashoka grove, but she insists on being rescued by her husband. Hanuman reports to Rama who assembles an army of Vanaras and crosses to Lanka where the final battle is fought between the heroes and the rakshasas. The divine name Rama was not only on the lips of Hanuman; He was enthroned in his heart. Rama gave Hanuman exhaustless strength... - Mahatma Gandhi. The divine name Rama was not only on the lips of Hanuman; He was enthroned in his heart. Rama gave Hanuman exhaustless strength. In Rama's strength Hanuman lifted the mountain and crossed the ocean. It is faith that steers us through the stormy seas, faith that moves mountains, and faith that jumps across the ocean. That faith is nothing but a living, wide-awake consciousness of God within. He who has achieved that faith wants nothing. Son of the wind the epithet refers to Hauman a Hindu deity, who was an ardent devotee of Rama. Hanuman is mentioned as an avatar of Shiva or Rudra in the Sanskrit texts and was the son of Anjana, an Apsara cursed to be born as a monkey and Kesari, after the couple performed intense prayers to Shiva to get a child. According to a story, when Anjana, was worshipping Shiva, king Dasharatha of Ayodhya was also performing penances for having children. The prasad (portion of the offerings) he received was to be shared by his three wives. A kite snatched a part of the Prasad and dropped it near Anjana. Vayu, the Hindu deity, caught it before it fell to the ground and delivered into the outstretched hands of Anjana, who consumed it leading to the birth of Hanuman. So he is also called the son of vayu, while still being considered as an incarnation of Rudra (Shiva). He is a central character in the epic Ramayana and also finds mention in several other texts, including Mahabharata, the various Puranas and some Jain texts. Hanuman is worshipped by villagers as a boundary guardian, by Shaiva ascetics as a yogi, and by wrestler for his strength. Ashok Kumar Jha in:Meghadutam: Translated into English in vers libre, Partridge Publishing Singapore, 8 July 2013, p. 85. Our road lay through the bazaar, close to a little temple of Hanuman, the Monkey god, who is a leading divinity worthy of respect. All gods have good points, just as have all priests. Personally, I attach much importance to Hanuman, and am kind to his people – the great grey apes of the hills. One never knows when one may want a friend. Rudyard Kipling in "Mark of the Beast" quoted in: Joseph Black et al. The Broadview Anthology of British Literature: The Victorian Era,Broadview Press, p. 779. Hanuman Monkey-headed Hindu god originally appears in the Ramayana, the earlier of the two great Indian epics, where he is described as a minister of the monkey king Sugriva and a devoted servant of Rama, the god-king who is the epics protagonist. After his birth the infant Hanuman is continuously hungry, and one day he attempts to eat the sun. Indra, the king of gods and ruler of heaven, is incensed at Hanuman’s action and strikes the infant with a thunderbolt, breaking his jaw (hanu)... -James G. Lochtefeld. After his birth the infant Hanuman is continuously hungry, and one day he attempts to eat the sun. Indra, the king of gods and ruler of heaven, is incensed at Hanuman’s action and strikes the infant with a thunderbolt, breaking his jaw (hanu). Vayu become very angry upon learning of his son’s injury and ceases to perform his usual activities. Since in Indian physiology winds are responsible for all internal functions- including digestion, respiration, and elimination – Yavu’s strike means that no one can live a normal life. After a short time the gods realize their predicament and beg Vayu for forgiveness; he is placated when each of the gods promise to give Hanuman a divine gift. By virtue of these divine gifts, Hanuman gains great powers. He is immensely strong and his image portrays him with bulging muscles. He is also skilled as a healer, both through his skill with herbs and natural medicines, and his magical abilities to protect people from evil supernatural beings. Among his most unusual divine gifts are the power to live as long as he likes and to chose the time of his death. James G. Lochtefeld in: "The Illustrated Encyclopedia of Hinduism: A-M", p. 271. Hanuman Jayanti is a Hindu holiday that celebrates the birth of Hanuman, the popular deity who appears as a monkey. Actually, he is of the vanara, the race of ape-like humanoids who play a prominent role in the India epic Ramayana. The vanaras were created by the gods to assist the deity Rama.in his battle against the demon Ravana. Hanuman led the vanara in the fight against Ravana. Watercolour painting on paper of Rāma and Lakṣmaṇa meeting Hanumān at Rishyamukha, the residence of Sugriva. Rāma and Laksmana are shown wearing dhoti’s with animal skins covering their shoulders. They hold bow and arrows in their hands and have their hair tied in a top knot on their heads... -British Museum. Watercolour painting on paper of Rāma and Lakṣmaṇa meeting Hanumān at Rishyamukha, the residence of Sugriva. Rāma and Laksmana are shown wearing dhoti’s with animal skins covering their shoulders. They hold bow and arrows in their hands and have their hair tied in a top knot on their heads. They face towards a male figure wearing a pink dhoti with a green shawl. He has a shaven head and raises his hands in anjali mudra. Behind the three figures is a staircase which leads up to a city on top of a mountain, Rishyamukha. On the edges of the staircase kneel monkeys wearing golden hats. In the centre of the city is a large building with a golden roof and a large red flag flying. The painting is surrounded by a black border. British Museum in: Collection online, The British Museum. ... describing his visit to the grove of the palace of Rāvana. He compares its rhetoric to a page of indecipherable calligraphy and thinks: the difference between human writing and divine consists in the fact that the number of signs of the former is limited, whereas that of the latter is infinite; hence the universe is a meaningless text, one which even the gods find illegible... - Octavio Paz. The Great Monkey closes his eyes, scratches himself again and muses: before the sun has become completely hidden — it is now fleeing amid the tall bamboo trees like an animal pursued by shadows — I shall succeed in reducing this grove of trees to a catalogue. A page of tangled plant calligraphy. A thicket of signs: how to read it, how to clear a path through this denseness? Hanumān smiles with pleasure at the analogy that has just occurred to him: calligraphy and vegetation, a grove of trees and writing, reading and a path. Following a path: reading a stretch of ground, deciphering a fragment of world. Reading considered as a path toward... The path as a reading: an interpretation of the natural world? He closes his eyes once more and sees himself, in another age, writing (on a piece of paper or on a rock, with a pen or with a chisel?) the act in the Mahanātaka describing his visit to the grove of the palace of Rāvana. He compares its rhetoric to a page of indecipherable calligraphy and thinks: the difference between human writing and divine consists in the fact that the number of signs of the former is limited, whereas that of the latter is infinite; hence the universe is a meaningless text, one which even the gods find illegible. The critique of the universe (and that of the gods) is called grammar... Disturbed by this strange thought, Hanumān leaps down from the wall, remains for a moment in a squatting position, then stands erect, scrutinizes the four points of the compass, and resolutely makes his way into the thicket. Octavio Paz in: The Monkey Grammarian, English-language translation, Seaver Books, 1981. The gods were my superheroes growing up. Hanuman, the monkey god, lifting an entire mountain to save his friend Lakshman. Ganesha the elephant headed, risking his life to save the honor of his mother Pārvati. "Pi Patel" in Life of Pi (2012), based on the 2001 novel by Yann Martel Vishnu, Rudyard Kipling in The Mark Of The Beast And Other Fantastical Tales , Hachette UK, 11-Nov-2010. Tulsidas wrote 12 books, but, by far, the most important is the Ramacharitamanas (the holy Lakes of the Acts of Ram), a Ramayana written in old Hindi (Avadhi) couplets. The book was written under the direction of Hanuman himself. It is read all over North India, and particularly during the time of the Ramlila. It is sung aloud in large groups for devotional purposes. Constance Jones, James D. Ryan in: Encyclopedia of Hinduism, p. 457.
eyes full of flowing tears wherever the fame of Rāma is sung. Ramaayana in: Satsang e- letter: Issue 19:6th April – Hanuman Jayanti, Swaminarayan.info.org, April 2012. Indeed, I hadn’t dared to think of that, but yes, indeed, when you read the Ramayana you’ll come across the story of Hanuman on which I built my version of that very old myth...I love Friend Monkey. I love the story of Hanuman. For many years, it remained in my very blood because he’s someone who loves too much and can’t help it. I don’t know where I first heard of him, but the story remained with me and I knew it would come out of me somehow or other. But I didn’t know what shape it would take. Lord Ram gave Hanuman a quizzical look and said, "What are you, a monkey or a man?" Hanuman bowed his head reverently, folded his hands and said, "When I do not know who I am, I serve You and when I do know who I am, You and I are One". - Tulsidas. The four fruits of life it ever is giving. - Tulsidas. Lord Ram gave Hanuman a quizzical look and said, "What are you, a monkey or a man?" Hanuman bowed his head reverently, folded his hands and said, "When I do not know who I am, I serve You and when I do know who I am, You and I are One". Tulsidas in: Munindra Misra Chants of Hindu Gods and Godesses in English Rhyme, Partridge Publishing, 7 March 2014, p. 128.
Who doesn’t know in this world your name `Problem Solver’ bells? Tulsidas in: Munindra Misra "Chants of Hindu Gods and Godesses in English Rhyme"
Eka-Nishtha or devotion to one ideal is absolutely necessary for the beginner in the practice of religious devotion. He must say with Hanuman in the Râmâyana, though I know that the Lord of Shri and the Lord of Jânaki are both manifestations of the same Supreme Being, yet my all in all is the lotus-eyed Râma. -Swami Vivekananda. There is a story of Hanumân, who was a great worshipper of Râma. Just as the Christians worship Christ as the incarnation of God, so the Hindus worship many incarnations of God. According to them, God came nine times in India and will come once more. When he came as Rama, this Hanuman was his great worshipper. Hanuman lived very long and was a great Yogi. During his lifetime, Rama came again as Krishna; and Hanuman, being a great Yogi, knew that the same God had come back again as Krishna. He came and served Krishna, but he said to him, "I want to see that Rama form of yours". Krishna said, "Is not this form enough? I am this Krishna; I am this Rama. All these forms are mine". Hanuman said, "I know that, but the Rama form is for me. The Lord of Jânaki (Janaki is a name of Sitâ.) and the Lord of Shri Shri is a name of Laksmi.) are the same. They are both the incarnations of the Supreme Self. Yet the lotus-eyed Rama is my all in all". This is Nishtha — knowing that all these different forms of worship are right, yet sticking to one and rejecting the others. We must not worship the others at all; we must not hate or criticize them, but respect them. Swami Vivekananda in: The Complete Works of Swami Vivekananda/Volume 9/Lectures and Discourses/Bhakti-Yoga, Wikisource. A great Bhakta [Devotee] (Hanuman) once said when asked what day of the month it was, "God is my eternal date, no other date I care for. Swami Vivekananda in: The Complete Works of Swami Vivekananda/Volume 7/Inspired Talks/Monday, July 1, Wikisource. As on the one hand Hanuman represent the ideal of service, so on the other hand he represents leonine courage, striking the whole world with awe. He has not the least hesitation in sacrificing his life for the good of Rama. A supreme indifference to everything except the service of Rama, even to the attainment of the status of Brahma and Shiva, the great World - gods! Only the carrying out of Shri Rama's best is the one vow of this life! Such whole - hearted devotion is wanted. Swami Vivekananda in: The Complete Works of Swami Vivekananda by Swami Vivekananda Volume 7, Conversations And Dialogues, Wikisource. Eka-Nishtha or devotion to one ideal is absolutely necessary for the beginner in the practice of religious devotion. He must say with Hanuman in the Râmâyana, though I know that the Lord of Shri and the Lord of Jânaki are both manifestations of the same Supreme Being, yet my all in all is the lotus-eyed Râma. Swami Vivekananda in: The Complete Works of Swami Vivekananda/Volume 3/Bhakti-Yoga/The Chosen Ideal, Wikisource. Hanuman, the best of the monkeys, became the most faithful servant of Rama and helped him in rescuing Sita. Swami Vivekananda in: The Complete Works of Swami Vivekananda/Volume 4/Lectures and Discourses/The Ramayana, Wikisource. Hanuman, the devotee of Rama, summed up his philosophy in these words: When I identify myself with the body, O Lord, I am Thy creature, eternally separate from Thee. When I identify myself with the soul, I am a spark of that Divine Fire which Thou art. But when I identify myself with the Atman, I and Thou art one. Swami Vivekananda in: The Complete Works of Swami Vivekananda/Volume 8/Lectures And Discourses/Discourses On Jnana-Yoga, Wikisource. His devotion to Rama was so great that he is still worshipped by the Hindus as the ideal of a true servant of the Lord. In the course of the article I described the 'god' worshiped by terrorists as 'a monkey god.' I was wrong and that was offensive. 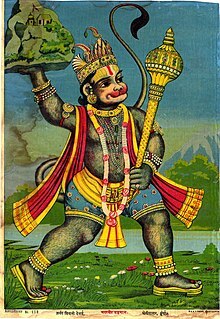 I owe an apology to millions of Hindus who worship Lord Hanuman, an actual Monkey God... Hanuman is worshiped as a symbol of perseverance, strength and devotion. He is known as a destroyer of evil and to inspire and liberate. Those are hardly the traits of whatever the Hell (literally) it is that terrorists worship and worthy of my respect and admiration not ridicule. Mark Williams (radio host) in: Samuel Goldsmith Tea Party Express leader Mark Williams says 'sorry' - to Hindus - for slamming Muslim's 'monkey god', Daily News, 20 May 2010. If you be very generous, you may think that like the great devotee, Hanuman. Swami Vivekananda in: The Complete Works of Swami Vivekananda/Volume 7/Translation of writings/Memoirs of European Travel, Wikisource. Raganuga Bhakti is of five kinds: (1) Shanta [peace] as illustrated by the religion of Christ; (2) Dasya as illustrated by that of Hanuman to Rama; (3) Sakhya [friendship] as illustrated by that of Arjuna to Shri Krishna; (4) Vatsalya [affection] as illustrated by that of Vasudeva to Shri Krishna; (5) Madhura (that of the husband and wife) in the lives of Shri Krishna and the Gopikas. Swami Vivekananda in: The Complete Works of Swami Vivekananda/Volume 6/Notes Of Class Talks And Lectures/Notes Taken Down In Madras, 1892-93, Wikisource.